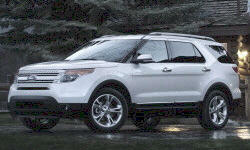 Why the 2011 Ford Explorer? Very comfortable in the front. Heated/cooled leather seats are awesome. A-pillars (especially lower area) are so big that sometimes smaller cars are hidden from view when trying to make a turn. The view to the rear is blocked by 3rd row headrests. Engine & trans work very well. Acceleration is deceptive in normal driving and if you want to go fast it will certainly do that too. Engine is very quiet unless you punch it, then it has an enjoyable snarl. For such a beast I'm pleased with the gas mileage. I average 19-21 in almost all city/suburban stoplight and rush hour driving. Highway mileage drops fast if you drive over 70. Keep it under 70 and I get about 24. I'm not a race car driver, and this rig is pretty big. But it handles well for what I need. My only big complaint is serious torque steer. I have the 20" wheels, not sure if that is the cause or not but the torque steer borders on dangerous. Once the final update was installed in the MyFord Touch/Sync system it works beautifully. No problems at all anymore. The other buttons require that you look to see what you're pressing which can be a problem in traffic. Why Not the 2011 Ford Explorer? Dealer keeps sending me letters telling me I'm violating my warranty by not having services done that are NOT called for in the owner's manual. And they wonder why I won't do business with their service department. If you even think you might ever want to tow anything or even use one of those hitch mounted bike carriers be sure to get the towing package. It's a cheap option and trying to retrofit after the fact is very expensive. I've had issues with the MyFord Touch system (fixed by latest update). Got annoying wind noise coming from somewhere around the a-pillars, and the mirrors have had water in the signals since new. I haven't bothered getting this stuff fixed yet. There are so many "toys" and options on the Explorer that it's difficult to find one equipped the way I wanted it. I ended up having to take some options I didn't want and not getting others I wanted. Hankook. Round and usually hold air. That's about the best thing I can say about them. Once they're worn out I'll replace them with Goodyear or Michelin.